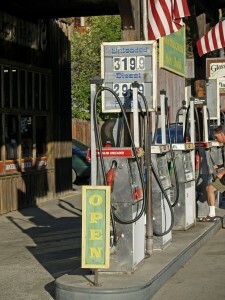 Put safety first and adhere to these gas pump safety tips! When you fill up at the gas station you usually don’t put much thought into it. You go through the motions and drive away. But, the gas pump has many dangers. Gasoline is highly flammable and is therefore extremely dangerous. Make sure you know how to stay safe at the gas station with these gas pump safety tips. Never smoke near a gas station. Even the gasoline vapors can start a fire. Be sure to keep any flames or embers away from the gas pump. Turn off your engine as you’re refueling. Not only does it effect the leak detection systems in your car, but it also poses a fire hazard. Don’t get in and out of your vehicle. Once you’ve started to pump gas, make sure to stay next to the pump. Going in and out of your vehicle causes static electricity which can spark a fire. Also, be sure to touch your car, before you remove the gas pump. That way you diffuse and static. Stay near the pump while filling up. When you walk away, you create a safety hazard. The gas pump could malfunction and cause a gas leak. Be sure to pay attention and stay near your car. Keep all electronics in the car. Your electronics use electricity that can start a fire. Be sure to keep them in the car away from the pump. Be sure to keep your car safe with the right auto insurance. Contact the professionals at Robert J. Los Insurance Agency to find you the right insurance. Located in Hamburg, New York, we serve all your personal and commercial insurance needs.